Please forgive me for being a little emotional today, but I feel like a prisoner who has been given a stay of execution. As you may remember, about six weeks ago we were told the Honolulu Star-Bulletin would print its last copy today. Then last week a judge gave the paper a reprieve of sorts and suddenly, the planned aloha party (wake?) at Murphy's tonight was canceled and our annual Christmas party was rescheduled. I guess the paper is still on death row, so to speak, but now should we dare hope for a commuted sentence? I know I would dearly miss writing this column. For over six years it has given me an opportunity to share with Star-Bulletin readers a broad spectrum of ocean recreation topics ranging from sailing regattas and fishing tournaments, to water safety and ocean pollution. Together, the readers and I have learned more about organizations such as the U.S. Coast Guard and its Foundation and Auxiliary, the U.S. Power Squadron, the Hawaiian International Billfish Association and its Pacific Ocean Research Foundation, the Hawaii Yacht Racing Association, and the Hawaii Women's Yacht Racing Association. We have gotten to know more about activities at yacht clubs, boat clubs, fishing clubs, sea scout bases and sailing schools. And we have met junior sailors, collegiate sailors, amateur sailors, professional sailors, and around-the-world sailors, along with fishing tournament promoters and anglers of every description. We have been able to get a better understanding of how our state's bureaucrats and politicians can both positively and negatively effect our maritime activities and the environment around us. On the positive side are the current public meetings taking place throughout the Islands of the Hawaii Coastal Zone Management Program regarding runoff pollution. We have also learned about the efforts of hundreds of volunteers who have been spending countless hours on programs to help reduce ocean pollution. These programs, coordinated by groups such as the Sierra Club, the University of Hawaii's Sea Grant Program and the Ala Wai Watershed Improvement Project, range from one-day litter pickups to long range runoff reduction plans. And, we have learned most of these volunteer organizations, like the Hawaii Operational Safety Team, which promotes safe, pollution-free use of Hawaii's coastal waters, are finding a way to create a positive interaction between government, business and the public. As I said, I would truly miss being able to share this kind of information with our readers. And, if my e-mail is any indication, there are many readers who will miss reading the Water Ways column, if only because there is no other weekly column dealing with ocean recreation on O`ahu. Why there is this lack of media interest, is a question I have trouble answering. Hawai`i is a state like no other. Here is a fleet of islands, bathed in a tepid sea and fanned by warm tropical breezes. 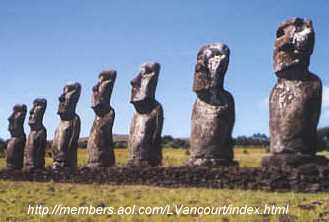 And the majority of the population and their leaders are reminiscent of the stone statues of Rapa Nui (Easter Island), standing side by side along the coast - with their backs to the sea, gazing inland. Would things change if our media focused more on ocean recreation, rather than just games with a ball? Or, must the public get more involved in water sports to attract the media's attention?